I love the Canon EF 70-200mm f/4 L IS USM lens . It's expensive but man, is it sharp! I bought it in September 2013* and I use it extensively. I use it probably more than I even should, because it is so much better than the 18-55mm lens. I bought the "nifty fifty" (Canon EF 50mm f/1.8 lens ) back in early 2011. It's a sharp, fast lens but I don't tend to use it very much for railfanning. The problem is that it is a prime lens, not a zoom, so it is not very useful for photographing moving objects. If it was a prime 24mm lens (or wider) it would be more useful. I tend to use the 50mm lens in low light situations because of its wide aperture (lets in more light) and sharpness. I recommend that everyone have a "nifty fifty" - they are sharp, fast lenses and very inexpensive. That leads us to the 18-55mm lens. It's an OK lens, but it is definitely not sharp. "Kit" lenses tend to be fair quality lenses but you generally want to upgrade from them (they're called kit lenses because they come in the kit you buy with your camera body). A similar focal range: 18-55mm, maybe 16mm at the low end but not more than 70mm at the high end. The focal length can't be longer than 18mm or it's not wide enough. An aperture of f/2.8 or f/4 at the highest. It has to be sharp. It has to zoom... not a prime. Image stabilization / vibration reduction is very important. All prices are Canadian and are store prices at time of writing. The top two lenses are the Canon EF-S 17-55mm f/2.8 IS USM Lens and the Sigma 17-50mm f/2.8 EX DC OS HSM FLD Lens. Both are very good lenses. I really want the Canon but the Sigma is $300 cheaper! The Sigma 210101 18-35mm F1.8 DC HSM Lens is an excellent lens, by all accounts. I would rate it higher but it has no image stabilization and the focal range is not quite as high as I'd like. That f/1.8 aperture is very tempting, though! Note that for these third-party lenses like Sigma, it's important to ensure you have the right lens mount. 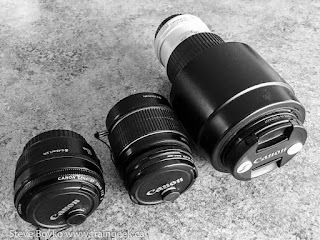 Since I shoot Canon, I've linked to the Canon versions of the lenses. They make lenses for Nikon and Sony as well, so don't buy the wrong lens. The next step is to go to a camera store and try the Canon and Sigma lenses out. Ideally the store would have both and I could shoot them both and compare the images at home. I know I can't take the lenses with me so that will have to do. I know my heart wants the Canon lens but I have to give the Sigma a good look. Thanks for reading! Are you in the market for a new lens? Or a new camera? * The reason why I know that I bought my 70-200mm lens in September 2013 is thanks to Lightroom. It was a simple matter to search by metadata and look for all photos I took with that lens. The first photo I took with a 70-200mm lens was a pan shot of a passing vehicle to test it out. +! for the Sigma lens. I've had the 17-70 on my Wish List for a couple years now. For now I've settled for a Sigma 18-250. It's not amazing in any focal length, but it's better than the Kit lens I had at 18-55, and it's quite flexible up to 250mm. The catch to such a wide focal range is you'll have to correct the lens distortion if you intend on using the photo for anything. Thanks Sean for your comment. Lightroom does a pretty good job of correcting for lens distortion but it's better to not have it in the first place. :) If I didn't already have a great 70-200mm lens I would consider the 18-250. If I was to make a suggestion, I'd go for two lenses, not one. :) I know this violates your specs, but I think would give you better results. When I travel, I always bring my 11-16 f/2.8 lens with me. It is great for shots within the station, shots on a platform, or when you are close to the track. I would then pickup the Canon 24-70 f/2.8 to cover the rest of the range. Everything I've read about the 24-70 seems very positive (except the price). I would stay away from any impulses you have for a fisheye. I have a 8.5mm fisheye, but have only used it a couple of times for rail images, and those were mostly of interior shots within cars (sleeper compartments, etc), and wouldn't recommend buying one. BTW: Don't be too down on your prime lenses. I typically pull out my 35mm f/1.8 when shooting trains at night. The extra stops help me keep my ISO lower since I need a decent shutter speed. I'm in the market for a new camera body to replace my trusty Olympus E-3 which is on the fritz and not worth repairing. I'll probably end up with an E-5 (probably the last Olympus slr) but those newfangled mirror-less units sure are tempting. Fisheyes to me belong in the same class as Lensbabies, tilt-shift lenses and so forth... novelty lenses that create a neat effect but not very useful in everyday use. I am tempted to rent the lenses. It's a bit annoying here in Winnipeg because there aren't a lot of places to rent them from, and they're not convenient to my location, but I should consider that. My 70-200mm f/4 lens is heavy enough! I considered the f/2.8 very briefly but the price and the weight both scared me off. Primes have their use, for sure, and they are very inexpensive for their quality. It just doesn't fit my need for a walkabout lens. Hi Brian, I would definitely be tempted by a mirrorless camera these days. I'll be writing a post about them in the next month or two. My only concern about mirrorless cameras is focus speed - right now they are slow to focus and that's not good for train watching, sports, etc. Otherwise they have a lot of advantages and if I were buying a camera from scratch, with no legacy lenses, I'd really consider a mirrorless camera. Good Morning Steve. The Olympus mirrorless body I would need to buy so that I could use my current lenses apparently focuses faster than the E-5 slr; and the E-5 was noted for very good focusing performance. I think the focus speed of mirrorless cameras is now much better than it was when they were first introduced. My problem is that my lenses are Four Thirds mount. They will work fine on a Micro Four Thirds mount (with an adapter) but I would loose the benefit of the smaller gear size which is the big draw of mirrorless for me. And because Olympus has shifted all their efforts to m4:3 and discontinued the original 4:3 system there is no residual value in my old lenses to help pay for new stuff. Oh well; such is life. So what was the final decision? Thanks Brian for your comments on the latest mirrorless cameras. I guess one would have to try the cameras to really see how the focus performance is. Gear obsolescence is always a problem. Hopefully you can find someone to buy your old lenses at a reasonable recovery. The Canon 17-55mm f2.8 works well. We have used that model many times on various assignments with great success. Good to know, Chris - thanks for the recommendation/confirmation!